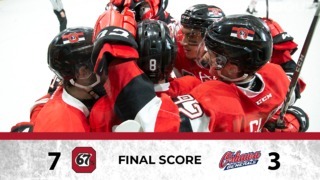 A late comeback by the Guelph Storm and an overtime power play goal put them over the Ottawa 67’s Sunday afternoon. Ryan Merkley scored with under two minutes to go to tie the game up, and the Storm would take the game in the extra frame 5-4. After the Storm opened the scoring, Ottawa came up with an answer. With the score at 1-0 Guelph, Sam Bitten put the 67’s on the board with his third goal in as many games. He took a pass and legally deflected the puck into the net off his skate for an early 67’s lead. Referees Quincy Evans and Mike Markovic originally waved off the goal, but a video review reversed the call on the ice. Guelph would re-take the lead on another deflected goal late in the period, with Hillis scoring at 16:58. The teams would continue to trade offence until the 67’s found some extra jam in the third period. It was 3-2 Storm late, when Travis Barron found the rebound of a Tye Felhaber shot to knot the score up at 5:49. Barron and Felhaber teamed up again at 8:08, putting the 67’s on top for the first time in the afternoon. The 67’s captain stripped a Guelph defender of the puck right in the slot, and made a heads-up pass to Felhaber who ripped home the go-ahead goal. It didn’t last long, however, with the Storm tying the game late on a Ryan Merkley deflection. Hillis notched his second of the game in overtime to seal the deal for the visitors. 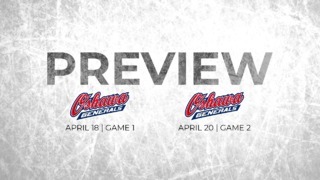 67’s G Cedrick Andrée made his first start inside the Arena at TD Place, making 37 saves in the losing effort. 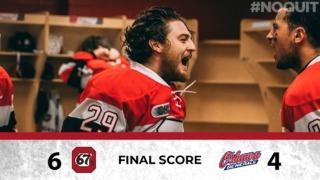 The 67’s forward line of F Travis Barron, F Sasha Chmelevski, and F Tye Felhaber showcased were all +2 in the loss, with each player notching a goal for the Barber Poles. F Sam Bitten now has goals in three straight games for the 67’s, after not scoring in a calendar month. After playing the majority of recent games with seven defenceman, Ottawa elected to play 12 forwards and six defencemen after an injury to D Noel Hoefenmayer Friday.